I could not resist. I crave quiet. I enjoy solitude. I think better, relax better, write better, pray better in the quiet. As I packed up for my days alone, a tiny bit of anxiety emerged. What if I didn’t like silence as much as I thought? What if I’m not as enjoyable to be with as I think I am? I reasoned with myself, that is the point of the spiritual discipline, to stick it out even when it isn’t comfortable. I arrived last night. Temps are in the 70’s. 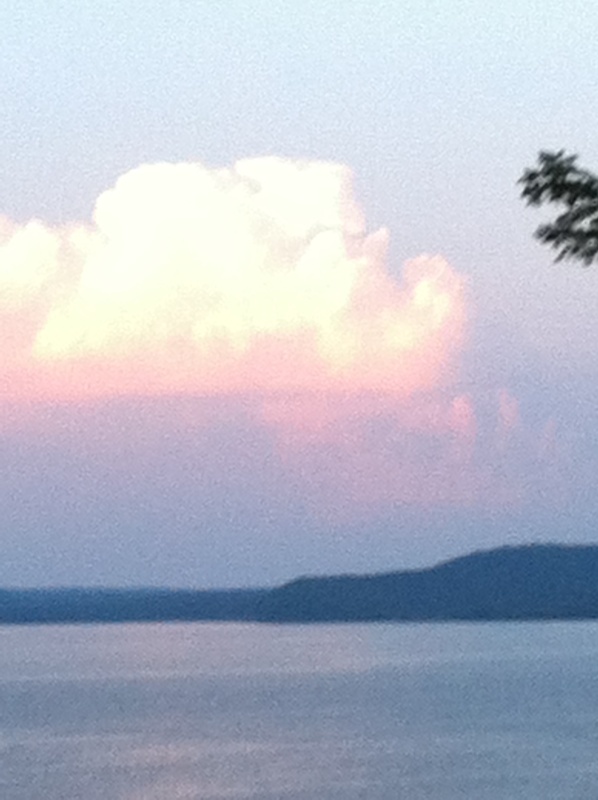 I sat staring at the lake all evening; watched the sunset in pinks and blues. Just looking at a waterline is reported to reduce stress. I believe it. Birds singing all kinds of songs with a duck chiming in at awkward times. Hummingbirds gripe at each other as they fly. Fishermen way down on the water, talking softly as they fish. And this is funny, the only neighbor in the near vacinity, either learning to play the violin or listening to a cd of someone learning to play the violin. And I am struck by my ability to be annoyed by the one person within my hearing range. Today’s revelation: silence isn’t silent. It is layer after layer of God’s created ones doing their thing-singing, arguing, talking, playing the violin badly. Creation, noise, and in it and through it, God. I’m blessed today to be able to listen for a change. And my favorite sound, the gripey hummingbirds. Who knew? I’m so glad that you have gotten away from the rush, rush world and are enjoying a “not so silent” time at a lake! I pray that you will enjoy God’s invitation to do nothing – except enjoy His world!